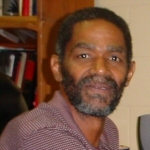 Robert “Bob” Davis is professor of sociology at North Carolina Agricultural and Technical State University. With a PhD from Washington State, he did postdoctoral work at the University of Wisconsin-Madison in the Institute for Research on Poverty and the Center for Demography and Ecology. His areas of specialty include suicide, homicide, poverty and education-related issues. A New Orleans native, Davis has lived in Greensboro, North Carolina since 1970. He is currently the Interim Chair of the Department of Sociology and Social Work. Past Director of A&T’s Institutional Assessment Office and Vice Chancellor for Academic Affairs and is past president of the North Carolina Sociological Association, The Association of Black Sociologists and Vice President of the Southern Sociological Society. Davis is Chair of the board of East Market Street Development Corporation and past Chairperson of the Guilford County Planning Board. Davis is actively involved in the Greensboro community as well as professional Sociological Associations. He describes himself as an avid runner and jazz fan. He is married to the former Shirl Brown and to this union one son, Robert Davis, III.